Freezer labels withstand cold, moisture and time! Special adhesive sticks firmly to foil, freezer wrap, plastic or glass. Won't fall off! 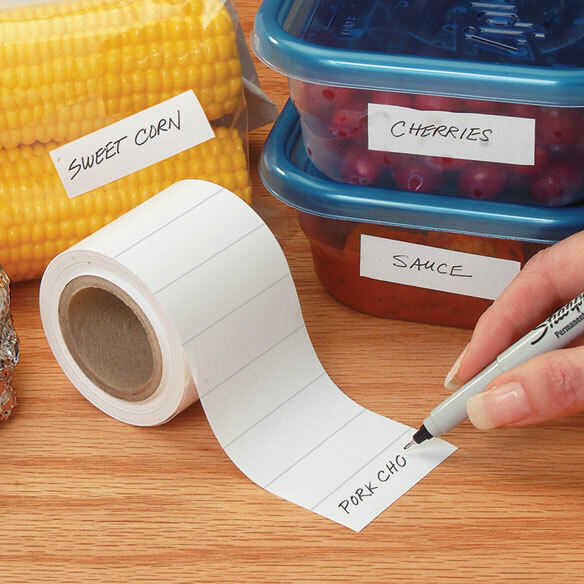 Write on freezer food labels with any pen or marker to label, date and identify contents. Make it easy to use food before time steals away freshness and flavor. Set of 500 labels; 2 1/4" x 5/8" each. Starting to lose my memory. It's very difficult to remember where things are these days, and extremely frustrating when I can't find what I need. These are the best ! I use them in the freezer and in my garden. I had a roll for many years and ran out recently. I am thrilled to have a new supply. We freeze food and would like to label it. We have tried writing with markers--the ink smears and becomes unreadable. We have tried other labels and they all fall off. These do not. They are the best labels ever. They accept ink easily, show the text clearly, and the label remains legible even with handling. These are terrific for frig or freezer to mark those dishes you can\t remember what you put in them. These labels made my life so much easier. These stickers were nothing like described in ad. They are very small and flimsy. Don't know how well they stick, yet because it took us a month to get them. I usually get things sent in the mail in about 5 days, but these took much longer. The company uses Fed Ex in combination with the USPS instead of simply putting it in a package and sending straight from a post office. I do not understand that at all. They were just some freezer labels. I do not recommend these at all. easier to write on than the plastic freezer bag itself. I have a full freezer with only items with store labels being marked. The rest is anybody's guess. I'm excited to use these. It is practical, and helps identify what is in the freezer. I have used these over the years and they work great. Stay n while on the freezer and peel off easily when taken out of the freezer. These look like they would be handier to use than freezer tape. Labels like this are hard to find. I freeze my own pre-prepared meals a lot! We have 2 refrigerators and 1 freezer never know what is frozen. To label my frozen foods. We pre-make our meals and freeze them. The label help identify the meal. Great for labeling left overs. Need and can't find. Reviews good. These stay on freezer items unlike other labels. Because I am running low on these labels. I do a lot of cooking for myself and others and these help me keep track of everything. Holidays are coming and I need a quick and easy way to identify my frozen items. My old freezer labels keep falling off - many if them are several years old. need these to label freezer stuff. Just what I was looking for,at a good price. To keep up with length of time food is in freezer. does this label come off easily after you use the contensts ? BEST ANSWER: Depends on the container, sometimes comes off very easily, and sometimes has a tiny bit of label still stuck to it. I think maybe if the leftover/container is hot, the label sticks a little. So my suggestion is let the container/leftover cool off first then put the label on. I really love the labels!! Hope this helps! They come off easy if you use warm water or "Goo Gone". will they work on the tabs of file folders? BEST ANSWER: Thank you for your question. You can use them on the tabs but they are not removable. We hope this information will be of help to you.